Choosing the right tile color for your floors can be a difficult decision. With the wide variety of shades, hues, and designs, it can be tricky to choose what's best for your dwelling. There are many factors that affect your final outcome. Knowing what they are and how they apply will prepare you to make the best possible choice when you choose a floor tile color. 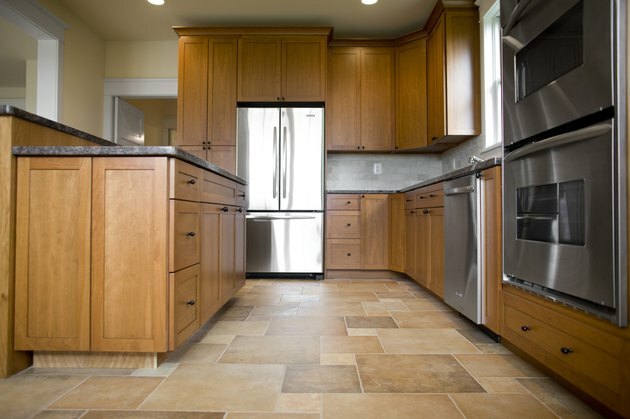 Choose a floor tile color that best suits your home. Compare color samples of the walls and decorations in the room with potential tiles. Ensure the tiles match the existing decor to avoid clashing once the tiles are installed. Choose between varied, complex tiles or simple, one-shaded tiles. Multi-color tiles are more eye-catching and will draw attention away from other points in the room, whereas plain, matching tiles will focus attention on and accent furniture and other decorations. Choose floor tiles that match the style of your home. Vivid colors such as black, white or purple are more matched to a modern home. Terracotta and rustic or pastel colors are more suited to older homes or ranch houses. Take potential tiles into the room that you are re-tiling. Lighting plays a large part in the final appearance of the tile, and the lighting will be very different in your home than the store. Place the tile on the floor in several different places around the room to judge the appearance. Choose lighter colors and shades for smaller, more compact rooms to make the room appear more spacious. Likewise, choose dark shades to make rooms appear smaller, and overly large rooms appear cozier.